Giving your little one a comfortable environment to travel in, the lightweight Maxi-Cosi Rock is an i-Size infant carrier which features improved impact-absorbing materials in it's hard, protective shell as well as superb side impact protection, so you can rest assured that your little one is always safe as possible when you're on the go together. This special bundle also gives you an infant carrier raincover and a mirror to keep an eye on your little one in the car. You can install the Rock into your vehicle using the vehicle's own 3-point belt, but it's only truly i-Size when used in combination with the Maxi-Cosi 2wayFix Base (sold separately) which can click into place on your vehicles ISOFIX points. The base can also be used in the next stage seat, the Maxi-Cosi 2WayPearl (also sold separately). When used with the base, it's very easy to install the seat in your car, just position it on the base and click it into place. Whichever way the seat is installed, it will always give your little one a safe and comfortable place to nap. A newborn inlay is included to add further comfort, and the seat has extra padding to keep your little one snugly in place along with the padded 3-point harness. A sun canopy is integrated and can be pulled out when required to cast some shade from the bright sun. The Rock is a rear-facing infant carrier, and it's widely recognised that rear-facing is the safest way for a child to travel. The impact absorbing material in the top side wings and the side protection system provides the optimum safety for your child in the event of a side collision. The Rock car seat is one of a few car seats that is approved for use in an aeroplane, so feel free to take it away with you on holiday! For your convenience, the cover is removable without having to dismantle the harness and is machine washable. This seat is compatible with all Maxi-Cosi, Quinny and many other strollers if you want to use it as part of a travel system. If you are using the Rock as part of a travel system, the included raincover will come in handy to keep your little one warm and dry during those unexpected showers! Also included with this bundle is a back-seat car mirror- perfect for observing your little one as they travel rear facing. 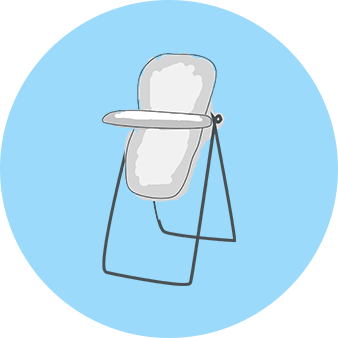 The mirror can be attached to a headrest using its straps and offers a wide-angled view of your little one without obstructing visibility.